Learning to play Here Comes the Sun is a great decision if you really want to improve your fingerpicking technique, and of course, learn a song that basically everyone loves listening to. It is a great song, but it is a bit difficult, so don’t expect to be able to play it overnight. Learning it is well worth the time and effort though, because it sounds fantastic and can be played with a single acoustic guitar without needing other band members. So, let’s sum up our Here Comes the Sun guitar lesson. The song is made up of 4 major parts, the verse, chorus, an alternate chorus, and the bridge. You’ll get a chance to learn each section of the song in detail during the lesson. Now I mentioned that this song is a bit more difficult than most of the songs you’re probably playing. The reason is that it doesn’t have a fixed, repetitive plucking pattern, since you’re basically playing the melody and base line both at the same time. 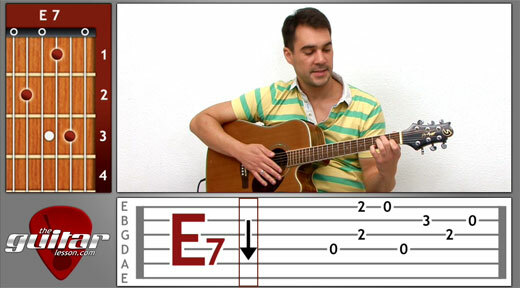 Watch the lesson and download the tabs, and while you’re learning the song, pay attention to how your thumb basically jumping back and forth from the respective base string to the treble strings. This is a constant base beat, which constitutes the base line in our cover of Here Comes the Sun. Concerning the capo, I think it’s best if you learn this song without the capo first, then try it in the original key of A major, by placing a capo at fret 7. You’ll find that it’s a bit harder since your fingers will be squished together, but you’ll get used to it with time. Be patient, practice it regularly, slowly at first and speeding up when you can, and you will get it perfected soon enough! The picking patterns take time to learn, so practice the different sections slowly. Once your fingers begin to remember the picking patterns then gently increase the speed. Here Comes the Sun was released in 1969 by The Beatles on their album Abbey Road, and is played in the key of A major (capo at fret 7). It is one of the most popular songs of group, beaten only by Twist and Shout in popularity. The song was written by George Harrison during a difficult phase of his life (arrested, surgery, quit The Beatles). He actually wrote the song at Eric Clapton’s house while walking around in his garden, free of his everyday troubles. Interesting fact: The song is so good, that Carl Sagan, famous scientist, thought it could represent humanity, and should be launched with the Voyager spacecraft’s Voyager Golden Record to provide any entity that recovered them a representative sample of human civilization. The Beatles wanted to do it, but their publisher, EMI refused to release the rights to the song (I guess they thought little green Martians listening to Here Comes the Sun without paying would be copyright infringement). The probes were launched in 1977, but the song was not included due to EMI. Here comes the Sun was covered by tons of bands and artists including U2, Massive Attack, Coldplay, Sheryl Crow, Bon Jovi, and many many more. Sorry, but you've reached a premium content area. The download of the Here Comes the Sun tablature file is only available to premium members. Sorry, the same goes for the backing track. To download the backing track to Here Comes the Sun, please log in and revisit this page. Hi there, others have said that on Macs, when you just click the GP6 download link, they just see a page of gibberish. You need to Right click -> save as on the link, and save the file onto your computer like this. n the video you say that we can check in the website the specific order of the diferents parts of the song but I did not see it. Oh you’re right, I’ll include that into the pdf file, in the meantime check out this Guitar Pro tabs file for here comes the sun, it includes the sequence.